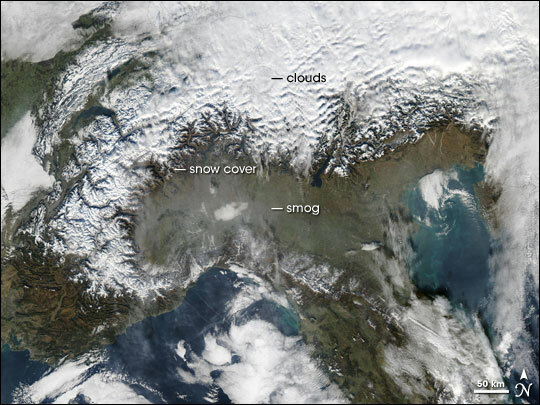 In northern Italy, smog collected at the base of the Alps in late December 2005. The Moderate Resolution Imaging Spectroradiometer (MODIS) flying onboard the Aqua satellite captured this image on December 23. In this image, the smog appears as a transparent layer of gray, just south of the snow-covered Alps. Clouds overhead partially block the view of the snow-capped mountains and parts of Italy to the south. As reported by Scotsman.com and the BBC, in the fall of 2005, a team of researchers at the Royal Netherlands Meteorological Institute assessed the worst areas of air pollution in Europe. The researchers used data from the Ozone Monitoring Instrument (OMI) on NASA’s Aura satellite. In that study, northern Italy proved to be one of Europe’s more polluted areas. Other pollution “hot spots” included southeastern England, Rotterdam, Antwerp, Germany’s Ruhr Valley, and Moscow. NASA image courtesy the MODIS Rapid Response Team at NASA GSFC. 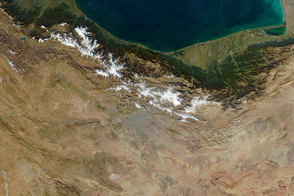 The MODIS Rapid Response Team provides daily images of this region.